Raising Pigs on the Farm in Cape Elizabeth!! We are offering half pig shares, to be picked up in the fall. The final price to be determined by the final weight of the pigs. The pigs enjoy all the same fruits and vegetables for breakfast and dinner, that we sell in the store. 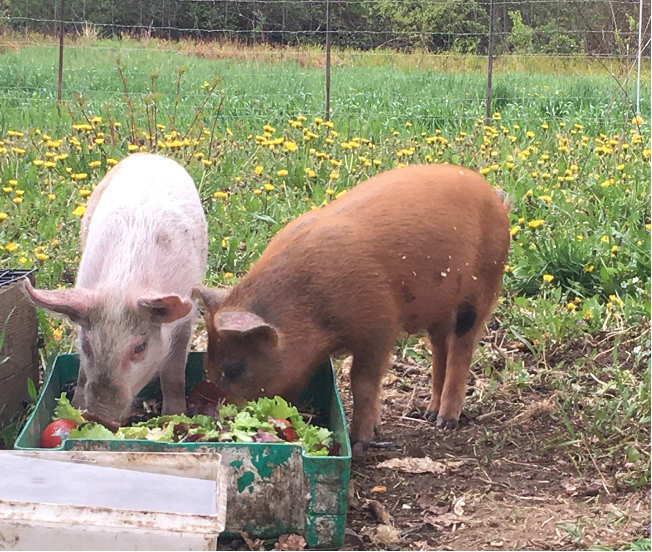 By raising pigs we have far less food waste on the farm, as day old lettuce, and scraps and spoiled or bruised tomatoes are their favorites. Their diet is supplemented with a little grain about twice a week, to make sure their protein intake is correct. 2017 we welcome Moana, Maui, and Pua. 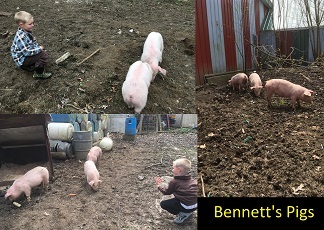 In the Early Spring Days of 2018 Bennett welcomed his new pigs, Dixie and Maui. Already enjoying some yummy Alewive's salad for lunch! 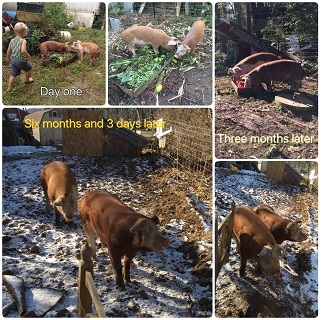 If you are interested in having fresh Cape Elizabeth pork and bacon all winter long, please give us a call (207-799-7743) or send an email (farmer@alewivesbrookfarm.com). We only have a limited number of shares.